Box Text: When belly-butting Chuck Rock gets snatched, only his six month-old son is ornery enough to go after him. Join the little stinker as he hitchhikes on dinosaurs, swings through jungles and intimidates tigers. Pout. Throw tantrums. Scream your lungs out. If all else fails, hold your breath until you're blue. If that doesn't work, give 'em the old one-two with your trusty club. It's amazing what you can get away with when you're still teething! 10-27-2012 exonerator Box Text When belly-butting Chuck Rock gets snatched, only his six month-old son is ornery enough to go after him. Join the little stinker as he hitchhikes on dinosaurs, swings through jungles and intimidates tigers. Pout. Throw tantrums. Scream your lungs out. If all else fails, hold your breath until you're blue. If that doesn't work, give 'em the old one-two with your trusty club. It's amazing what you can get away with when you're still teething! 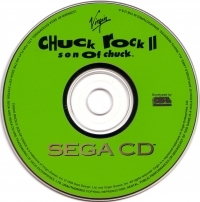 This is a list of VGCollect users who have Chuck Rock II: Son of Chuck in their Collection. 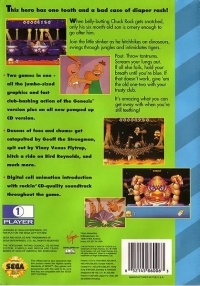 This is a list of VGCollect users who have Chuck Rock II: Son of Chuck in their Sell List. 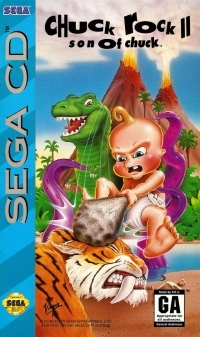 This is a list of VGCollect users who have Chuck Rock II: Son of Chuck in their Wish List.